Written by Chris McGrath, Colleen Olfenbuttel, Black Bear and Furbearer Biologist, and Perry Sumner, NCWRC. Weight: females 30-70 lbs. ; males 30-80 lbs. Bark, twigs, leaves, pond lilies, reeds, duckweed, alfalfa and clover. Monogamous. Sexually mature in 2-3 years. Mate for life and produce a single litter each spring. Called kits. One litter per year, born in spring after gestation period of about 4 months. Typical litter contains 2-6 kits, eyes open at birth, weaned in 6-8 weeks. Kits stay with mother the first year, remain with colony as yearlings for their second year. May live 20 years, but usually half that or less. Beavers were originally found throughout North America. In the 1930s, beavers were reintroduced into North Carolina by the agency that has now become the N.C. Wildlife Resources Commission. Since that time, beaver populations have flourished. In fact, beaver recovery in North Carolina has been so successful that trapping is once again needed in some areas of the state to stop timber damage and flooding caused by North America’s largest rodent. During the last two centuries, beaver fur was a valuable commodity, used in the hat trade and eagerly sought in Europe and the United States. Beaver fur may not be as valuable today, but the beaver still fascinates us because of its natural engineering abilities. For this reason it is known as “nature’s architect.” Perhaps it is the beaver’s ability to alter its environment and construct a home—a behavior similar to our own, that makes the animal so interesting to us. There is one species of the beaver in North America. 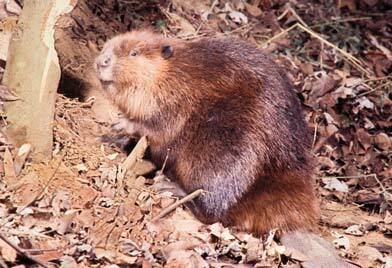 However, 24 subspecies of the beaver once existed in different regions of the continent. Beavers were common in the North Carolina area and in North America before Euro pean settlement. About 60 million are estimated to have lived in North America before extensive trapping. As America was colonized, however, intense unregulated trapping of beavers for fur wiped out most of the populations east of the Mississippi River, including North Carolina’s beavers. The last native North Carolina beaver was trapped in 1897. In the 1930s, beavers were reintroduced into North Carolina by the agency that has now become the N.C. Wildlife Resources Commission (NCWRC). Since that time, beaver populations have flourished. 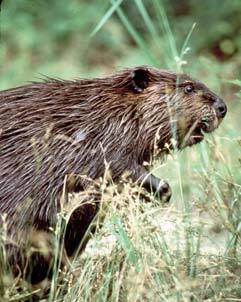 The beaver is the largest rodent in North America, weighing between 35 and 50 pounds as adults. However, beavers weighing up to 90 lbs. have been reported. Beavers are 2-3 feet in length, with an additional 10-18 inches for the tail. Males and females are similar in size. Beavers have short front legs and webbed hind feet with a double claw on the second toe that the beaver uses to comb its fur. The beaver’s fur is chestnut brown to blackish, depending on the individual. Two noticeable features are its four large yellow incisor teeth used for cutting bark and chiseling trees, and its large flat hairless tail. Muskrats, also an aquatic rodent, are mistaken for beaver, but have ratlike tails and weigh less. The beaver uses its tail for swimming, for communicating warnings, for storing fat and also for support. Beavers are slow and clumsy on land, but agile and quick in the water. Newborn beavers are called kits in their first year and yearlings in their second. Beavers are herbivores, feeding mostly on the inner bark of many kinds of trees. During the summer, they also consume large amounts of aquatic vegetation. In some areas, they’ve been known to eat corn. Beavers construct dams on flowing water to back up the water so that it becomes deep enough to swim in. They also live on deeper lakes or rivers where they don’t need to build dams. For a home, beavers either build a lodge of sticks and mud in their ponds or they burrow into the high banks of streams or lakes. Both burrows and lodges have underwater entrances. With few natural predators left, beavers can thrive and multiply anywhere there is water and ample food. Beavers stockpile branches and small trees in autumn to use as food during the winter. They don’t eat the wood, but feast on leaves, twigs and bark. Beavers also cut trails to feeding areas and sometimes dig canals to make it easier to transport food back to their lodge or food pile. Autumn is the busy season when they repair dams and stockpile food. Beavers are most active from dusk to dawn. Beavers mate for life and live in colonies of one adult pair, their kits, and the yearlings from the previous breeding season. This colony has a territory, usually surrounding their pond and marked by mounds of mud and plant material. They deposit a type of oil that marks their territory. Beavers usually stay away from humans, but often beaver territories can overlap with people’s property. This is how the trouble begins. Beavers often block drainage ditches and culverts, which may cause flooding in agricultural fields and residential areas. They also flood some forest areas, which may kill valuable timber. They can also destroy timber by chewing on or felling trees. On the positive side, their ponds help control erosion and sedimentation, and they provide valuable habitat for wood ducks and other wetland wildlife. The best way to prevent conflicts with beavers is to trap them during the regulated trapping season (November 1 through March 31 statewide), when they can be used as a renewable natural resource because its pelt, meat and castor oil are highly valued. While many people think about beaver only when they are causing problems, it is important to remember the beneficial aspects of beavers. By damming streams and forming shallow ponds, beavers create wetlands. These wetlands provide habitat for a tremendous diversity of plants, invertebrates, and wildlife, such as waterfowl, deer, bats, otter, herons, songbirds, raptors, salamanders, turtles, frogs, and fish. But it is not just wildlife that benefits from beaver-created wetlands; people benefit, too. During periods of drought beavers provide water for wildlife, livestock, and irrigation. Wetlands control downstream flooding by storing and slowly releasing floodwater. They also improve water quality by removing or transforming excess nutrients, trapping silt, binding and removing toxic chemicals, and removing sediment. Flooded areas can also recharge groundwater. Beaver ponds often provide abundant recreational opportunities to sportsmen for hunting, fishing, and trapping. In addition, trapping for beavers and other furbearers and leasing beaver ponds for waterfowl hunting can provide valuable supplemental income to landowners. Hall, E. Raymond, The Mammals of North America (Wiley-Interscience Publication, 1981). Rue, Leonard Lee III, Furbearing Animals of North America (Crown Publishers, Inc., 1981). Webster, William, James Parnell, and Walter Biggs. Mammals of the Carolinas, Virginia, and Maryland (University of North Carolina, 1985). "Dam Beavers." Natioanal Geographic Animals Documentary. http://youtu.be/1TIJRt9_q_g (accessed February 23, 2015). Illustrated by J.T. Newman. Photos by Steve Maslowski and the North Carolina Wildlife Resources Commission. 22 November 2010 | McGrath, Chris; Olfenbuttel, Colleen; Sumner, Perry W.
I live in t he rural part of Macon County, There used to be a 1 acre pond on my property. I would prefer to create a wildlife area and have thought Beavers might be the way to accomplish this. II th is is correct where could I obtain a pair? I would recommend contacting the NC Wildlife Commission at: wildlifehelpline@ncwildlife.org. They should be able to answer any questions you have about wildlife in North Carolina. Have a question. I live in Pitt county , North Carolina. What are the requirements for me to legally trap beaver and are their any requirements for the land owner , ( license , permits . etc. ) ? Thanks for posting a comment in NCpedia! I've forwarded your question to Reference Services at the State Library of NC's Government & Heritage Library. Someone in reference should be contacting you soon. Good luck in your research! I live about 3/4 mile from Swift Creek in Edgecombe County. Beaver's have never been a real problem until the past 5 years. They have dammed up the entire creek creating a dam some 800 feet across and at some depths up to 15 feet deep. (Don't believe me - come take a look yourself). My question is how can the land owner just sit back and watch their forest die because of this beaver problem. I know we have to live with nature but this was not a problem until they were reintroduced back in the waters of NC. What is the correct approach to handle the problems of flooded paths and the continuous decline of hardwoods on personal property? Thank you for your inquiry about Beavers! I am forwarding your question to the Wildlife Resources Commission. Their direct email addess is wrccomments@ncwildlife.org; more information about the agency can be found at http://www.ncwildlife.org/. Thanks for taking the time to post a question to NCpedia. Good luck in your research!